You are here: HomenextPlacesnextSchoolsnextBenfield Junior SchoolnextCan you spot a face here? Back row l to r: ?, ?, Peter Crouch (? ), ?, Margaret Hughes, ?, Raymond Guy (deceased), John Baker, Alan Phillips. 3rd row l to r: ?, Judith Clark, ?, ?, ?, Susan Vassey, David Fuller, ?, ?, ?, ?, Chris Poole (?). 2nd row l to r: Derek Gough, ?, Maurice Forrest, Trevor Mayhew, Arthur Pumfrey, Brian Harding (? ), ?. Front row l to r: ?, ?, Paula Harisson (? ), ?, ?, ?. Can you fill in any of the question marks? I went to this school between the ages of 8 – 11 so I would have left in 1959. Over that time I only remember Mr Brooks, the sweet shop and the cattle arch to Vale Road. We lived in St Andrews Road at that time moving up to Old Shoreham Road opposite the Golf Course later on. I went to this school from 1967 to 1969 when I moved to Brisbane, Australia. I would love to see photos of that time if anyone has them. I lived in North Road, Portslade. Hi Kim. I used to live in St Andrews Road, we used to play in all the wrecked houses between North Street and St Andrews Road. I would think it was very dangerous but what did we care! One Nov 5th there was a giant bonfire in one of the streets. Another favourite place was the waste ground off Vale Road – lots of earth mounds to jump our bikes on. I left Benfield for Portslade County in 1959-60. My sister Gill Edwards went here until 1964 – then Portslade Girls. She lives on the Isle Of Wight. Back row l to r: ?, Pamela Thompson, Peter Crouch, ?, Margaret Hughes, ?, Raymond Guy (deceased), John Baker, Alan Phillips. 3rd row l to r: ?, Judith Clark, ?, ?, ?, Susan Vassey, David Fuller, ?, Roger Reeve, ?, ?, Chris Poole (?). 2nd row l to r: Derek Gough, William Mason(? ), Maurice Forrest, Trevor Mayhew, Arthur Pumfrey, Brian Harding, ?. Front row l to r: Kenneth Wrist, ?, Paula Harisson, Angela(? ), ?, ?. John Baker, do you have a son called Michael Baker, who used to be a Mod in the early 80`s? A long time ago but I think one of my childhood friends was Derek Gough, we lived in Links Road. I didn’t go to Benfield myself, being a Catholic I was sent to St Mary’s in Trafalgar Street I think it was. Derek had a brother, twin I think, and we all hung around with a girl called Helen – my first love! Circa 1957-8. What a lovely surprise Stuart – I just took a second look at this page having found it a few days ago. I lived in Links Road from 1953 to 1974. Derek Gough and his older brother, Malcolm, lived a few doors down from our house – we lived at 47. I went to Benfield School and have a very similar photo to the one posted on here – must get round to putting it on the site. So many memories have been triggered by this comment – playing in the woods on the golf course, making tree houses and camps, building home made go-carts and trying them out in The Gardens and Garden Close – where two other friends, Ann Holland and Susan Bennett, lived. Later we tried out the carts at the ‘Rec’, which had quite a steep hill at the northern end- I had a habit of falling out of the carts and I still have the scar on my knee from one of those. Some of the other kids in Links Road, some of whom also went to Benfield, were Victor Leonard, Nicholas Coxhill, Janet Chandler and Margaret, whose last name is something like Hardman – possibly. My mind has gone blank on the others I am afraid. Thank you so much Stuart for the trip down memory lane – I hope life has been kind to you. I went to Benfield the first year it opened. I think Miss Hunt was Head and Miss Clifford, deputy. Miss Clifford sacked me as Jesus in the Christmas Nativity Play. What happened to Jill Russell from Foredown Drive? Don’t you mean Jackie Russell? I always thought that she was lovely! Her Dad was a pianist and always encouraged me to continue playing the guitar. I still play 53 years later! Living at 24 Links Road, having been born at no. 3 in 1944, I watched the main hall being built, as it could be easily seen from the front windows of no. 24, looking straight up the Gardens (there weren’t the trees then). I recall being told that “that was where I would be going to school”, as indeed happened after St Nicholas Infants. Miss Belinfante (later renamed Belafonte) is my abiding memory, and I am sure she had much to do with my love of English later on. I also recall Mr Galagher and his early Vespa scooter. Mr Andrews was the kindly old gent with the sweet shop, where our pennies were easily spent, when we had any. (Scavenging discarded orange boxes from Fryco in Victoria Rd., and then selling them for firewood to the inhabitants of Links Rd. was one way I and Stephen (Steven?) Clifford from no. 47 would augment our meagre pocket money). I too recall the soap box rides down that steep slope in Victoria Rec – Steven had made a cart from just such orange boxes; it seemed that the more hazardous the pursuit the better it was ! From the school I particularly recall Sandra Butterworth (coming up for 65 next Feb 22nd – sorry Sandra !, Gillian Secker, of hand puppet fame, and Veronica Harland, next to whom I sat in Class 1, and Rita Shimmins, sadly no longer with us . – seems I only recall the girls! Oh yes -Jeremy Pender, of course – we made good and made it to the Hove County Grammar, as did Sandra, and Gillian, I think, with Rita excelling and getting to the GirlsHigh School. Happy days! I just came off the phone from speaking to our fellow-Benfielder Frank Morgan (Drove Crescent, then Brambledean Road), it being his own 65th today, trying to convince him how splendid next summer’s reunion is going to be. Sadly, though, his mother (Dulcie) has now passed away, and he feels no great pull to Brighton and Hove anymore. From Roger Hudson via email: I always remember Frank Morgan’s birthday, and rather curiously have done ever since we were at Benfield together. He was also my next-door neighbour in Drove Crescent for a few years before moving down to Portslade proper! The reason is that he was 10 on the 10th of the 10th. I spoke to him a few years back, but realised that he had certainly moved on from his childhood days. (Haven’t we all!) Frank, I believe, owned a few betting shops in the last few years. He was always good at maths! We were mates for a little while when we were kids. I remember his mother Dulcie well too, who was also a friend of my mother’s for a short period before she moved away from Portslade. I just came across this sight because i am writing a book about my childhood in the 1960s and was doing research about my old schools. I was at Benfield between 1964 and 1968. One chapter in my book is actually called Miss Belinfante! She was an amazing woman and I agree with you Terry, she certainly inspired me. Thanks to her I was fortunate enough to go on to pass my 11 plus. All those horrific monthly tests certainly paid off. I too remember Mr Gallagher and Miss Clifford. Also Mrs Dawson, Mrs Royston and Miss Riley who taught those we used to call the ‘slow’ kids. I lived in St Nicholas Road, so all the above places mentioned are very familiar to me. My maiden name was Clark and all of my older siblings went to Benfield, Tony, Anne, Michael and Peter. Anyone remember them? I’m very sorry to have to tell you all that Miss Belinfante, at the grand old age of 94, passed away in October. I’ll be glad to make sure that her niece, who gave me the news at Christmas, gets to hear of any reminiscences you’d like to post here during the coming months, and I’ll also put a similar note up at the My Brighton and Hove Yahoo! Group site.That sad duty done, I wish all you Benfielders a Happy New Year and hope to see some of you at the school’s 60th birthday party this summer. Hi to Chris Edwards and Kim Evans, both now of Brisbane. I got there before you I think – being a Benfielder from approx 1953-6. I too, now live in Brisbane, but, beat this – I live in Brighton, Queensland! I remember Miss Hunt, Mr Gallagher and Miss Clifford. The class teacher who stands clear in my memory banks is Mr Needham, whose patience I exhausted on many an occasion! Chris and Kim, we should have a Benfield reunion Down Under. Thanks to all you folk who have put this website together, and to Chris McBrien my old mate from Benfield Way, for pointing me here, and for all he has done for me. Hi to anyone who remembers me. I used to do a Paper Round from Cherry’s newsagents which took me along the Old Shoreham Road, Benfield Way, Sharpethorn Cres and all over that area. Carol White lived at 271. Old Shoreham Rd. and Steve at 261. Hi Steve. Also at Benfield the Staff were; Mr Holden, Whiting (Head), Ellesworthy (Deputy), Gallagher, Prestly, Miss York, Evans, Reidle. Mr Prestly had a small clothing fire in his house and came back to school a bit burned from the accident. I think he and Miss York got married later. The Valiant crash of 11-May-1956. Look for WP202 Crash on the Internet. Chris has missed me out. I was there from 51-56 and remember most of those names. Glad to see Roger Karunaitis-Hudson (Carrots) still playing guitar. I hope this isn’t too late (been hibernating recently) but I was sad to hear of Miss Belinfante’s death. 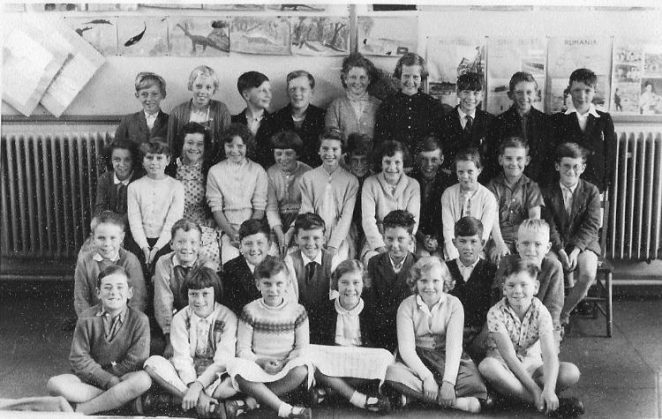 We moved to Portslade in 1958 and I attended Benfield School from then to 1960, when I went on to Hove County Grammar. Those two years in Miss Belinfante’s class were definitely the happiest of my schooldays. One thing I remember fondly was our weekly general knowledge questions. Every Friday Miss Belinfante wrote up 10 (or 12?) questions on the blackboard eg: “What is the longest river in the world?” or “Who discovered America?”. Having copied the questions into our blue notebooks, we then had until the next Friday to discover and write down the answers at home. In our house, solving the queries was always a family event. My Dad could often give the answer straight away. If not, out came the encyclopaedias (my Arthur Mees’ Children’s Encylopaedia, a set of 10 old brown volumes from the 1930s). Sometimes, a visit to Hove Reference Library was needed. It was homework taken seriously and even enjoyed, and most of my general knowledge today probably stems from that weekly exercise. I also remember knitting (or trying to) a red and white egg cosy with vertical stripes. Miss Belinfante kept patiently showing me how to strand the colour not in use at the back of the work. When I insisted, at about the eighth try, that I had done it correctly but it had got itself on the incorrect side despite me, Miss B said not a word but merely raised her eyes to heaven, pulled my knitting off the needles and flung it in the waste-paper basket. This caused great hilarity when I recounted it at home. She was a truly great teacher and I will always remember my time in her class with affection and gratitude. Guys ‘n Gals. I used to live at 21 Benfield Crescent, off Foredown Drive. We lived in fear of ‘Greenie’ – the grass cutter on the golf course. He could spot us mischief makers a mile off. Tree camps and later on weedkiller and sugar devices that went bang! We’d be locked up today. Was that a bomb crater, in the woods, just north of the path across the golf course from the bottom of Sharpthorne? Dad had an allotment on the Hangleton side. Pulling fresh carrots and eating them on the walk back to Benfield Crescent. A walk from there to the Devil’s Dyke was a major feat. Running under the pylon wires in case they fell on you. Overton’s at Mill House for a 3d. tub of icecream. Ah, the cat needs out, back to reality. I was really sad to hear of Miss Belinfante’s passing, although I was quite surprised to hear that she was still alive so recently. As I previously mentioned I have a chapter dedicated to her in my forthcoming book. I would like to share a few passages from it which you could perhaps pass on. Regarding Miss Belinfante, (I always thought she was Miss Bellefonte), she was a very good teacher but she absolutely terrified me and I remember she had made some of the class stand on their chairs for some fairly serious mis-demeanour and she then marched up and down between the rows of desks with what my memory insists was a chair leg in her hand. She would whack it into her other hand and then, when passing one of the miscreants, she would whack them across the back of the legs. Sounds outrageous now but this was not a common occurrence unlike the ruler across the hand – ouch. She was a tiny lady, in height terms, but she had a huge personality and it amazed me that anyone ever did anything wrong in her class. I am fairly certain that punishments were really few and far between but they made an enormous impression, as did the power of Miss Belinfante’s persona. It is good to read about the high regard she was held in and what a positive affect she had on the lives of so many. I would also commend Miss Clifford who had a similarly profound effect on my life and was a wonderful teacher. My name is abit unusual so might trigger some memories! I would have been there about 64-69. I used to live in Mill Close, my best friend was Joy Carpenter. I do remember a John Baker, don’t know if it is the same one mentioned in the photo. I was in Miss Clifford’s class and my sister Anita, now in Australia was in Miss Belinfante’s. What a lovely school. I have just had a senior moment. The years I put in the previous comment was when I went onto Mile Oak School for Girls. I was there for about two years 63-65. Hi Alpha, I was in the same class as your sister Anita. I remember going to your house a couple of times. I remember Anita playing the tambourine as I believe you were Salvation Army members. Anita was my main rival in Miss Belinafante’s class for getting top of the class for the monthly tests. We both went on to Grammar school and she was in my class there too. Please say hi to her for me (my maiden name was Clark) although she’ll probably remember me as a bit of a rebel during my teenage years. She was a far more sensible young lady as I recall! Calling all former attendees at Benfield School – remember a 60th anniversary and reunion is planned for this summer – 2009.Kf any of you can make it and want to know more – contact Jeremy Pender -as per his message above, at: portslade_and_west_hove_fifties_nifties-owner@yahoogroups.com. The rest of this is a message for Terrence (Terry) Reed – if you ever come back to this page Terry, please accept my thanks for bringing back some happy memories of you and my brother, Stephen (Steve) Clifford. You may not remember me much, except as Steve’s young sister, who always wanted to join in when you played darts, or ride in the cart you and Steve built, when driven down the hill at the rec etc., – mind you driven is a bit of a misnomer, as it was really a matter of hanging on like grim death until it came to halt on the flat – Steve tried to dissuade me, saying “you know you won’t like it, you get too scared, and you fell out last year, when you went in one, just going down the hill in Garden Close, because you leant when you shouldn’t and didn’t hold on properly; and that was a much smaller hill”. I was having none of that and after some “I’m bigger now and I will hold on and I won’t lean, or be scared. Promise.” and when that didn’t work some “it’s not fairs” and multiple pleas, or “please, please, please”; Steve gave in. However, I was suitably repaid for my pestering as I did get scared, I didn’t hold on and I leaned. Which led, inevitably to my being unceremoniously tipped out – again! I don’t remember if Steve said “I told you so” or not – he was a very kind, big brother, so maybe he didn’t. I certainly wasn’t going to tell him that I had fallen out going down the hill at Garden Close, again, just a week or so before! I think that cart was built by Derek Gough – and my falling out was nothing at all to with the build quality – and yes, he warned me too. No-one who knows what a seasoned pillion passenger I am now, on a high speed sports bike, would ever believe that I could have been such a total klutz and complete failure in my early years. Anyway, I have digressed but I do want to thank you Terry, I remember you and your parents very well. Sue Bennett and I were talking about you and others from Links Road, just yesterday – but that’s for another entry perhaps. Unfortunately I have to tell you that Steve, my lovely brother died in December 2003. He had a very happy life though, with his wife of over 30 years, and two super children. There is a beautiful grandson now too. I hope life has been kind to you too. If you want to know any more, do contact me on: Natbrent@fastmail.fm Sue Bennett and I will be going to the Benfield celebration, this summer, and we both hope to see some old friends there too. Hello, all past Benfieldians! We will be celebrating our 60th anniversary during the week 29th June – 3rd July. If anyone has any photographs of their time here, I would be really grateful for the loan of them as we are hoping to put on an exhibition. Also, any memories of Benfield days would be gratefully received. Please contact me on office@benfield.brighton-hove.sch.uk. Watch this space for further details of our special week. I’m afraid I have to tell you all of another passing, that of our 1952-1955 classmate Roger Karunaitis-Hudson, who’d been living in France for the past few years. Roger died yesterday (31 May), and his funeral will be in Montemboeuf on Friday (5 June). Hello again Terry, very sorry you couldn’t link to my email. I discovered, yesterday, that a whole host of emails had been put in the junk mail folder, for no discernible reason – I do hope yours wasn’t one of those. Not sure if the re-union will happen or not but if there isn’t an official one, there is a chance we might get an unofficial one instead; will just have to see what happens. I do hope there is something as I am really looking forward to spotting the handsome man, who cannot possibly be 65! If you feel like trying to make contact again : Natbrent@fastmail.fm – which I know you’ve already tried but you never know, or a new one: Ladyshippers@googlemail.com – I do hope you come back to this page and give it another go.Your Dad did do well and fancy him having been shopping for Mr Martingale – or was it Martindale? I cannot remember if my Dad ever was still around then, perhaps not. Mum died in 1986 and Dad in 1989. I was talking to Sue Bennett recently and we were reminiscing about the people we knew in Link Road etc., Mr and Mrs Oliver, Mrs Copeland, Mr Carpenter, The Goughs, Mr and Mrs Leonard, and their son Victor; Bunty’s family (OK, I confess, I cannot remember the surname) The Hardimans, The Barracloughs, The Chandlers, and…… fiddle and phooey, what was ‘The Garage Man’s name’? – so called because he rented out garage – he lived almost opposite us. Oh dear I really need to put a lot of this on a page about Links Road, or Portslade, or something. Oh, well never mind eh – as Steve often said – there is often a lot of crossover information. Are you still in the area Terry? The Benfield 60th Anniversary reunion for ex pupils is Friday 3rd July, we’ve only just heard I’m afraid but I cannot work out the exact time as yet,but it is lunch time – I will post again once I’ve worked it out, plus what is needed if you want to attend. Benfield Junior School, Portslade — 60th Anniversary celebrations, 29th June to 6th July. Please copy this address into your internet browser: http://groups.yahoo.com/group/portslade_and_west_hove_fifties_nifties/messages/33?threaded=1&m=e&var=1&tidx=1 – for the latest news and let me know if you’d like the timetable sent to you as a .doc file (for printing copies, say). Editor’s note: If anyone wants to contact Jeremy via this page they will have to put their email address in the body of their message. You also need to remember that this allows everyone else who visits the page, to see the address. I am sorry that we are not able to act as intermediary for the exchange of emails. Good luck with the celebrations. I hope you will let us have a report and photos. The Benfield 60th Birthday Celebration week will take place next week 29th June – 3rd July. All past pupils are invited for lunch on Wednesday 1st July at 12.30pm. We would love to see you and our Year 6 pupils are looking forward to giving guided tours to you all. Please either e-mail office@benfield.brighton-hove.sch.uk or ring 01273 294950 to book lunch. Have just spoken to Jacqui and the lunch for ex pupils is at 12.30 next Wednesday, 1st July. Please could anyone who intends going (hopefully quite a few, other commitments permitting) – either let Jacqui know Phone: 01273 294950, or email me at Natbrent@fastmail.fm and I will pass the information on, so we aren’t fighting over food – that could be too much like stepping back in time! Sorry for all the confusion and I do hope to see some of you there. Hi everybody – I go to Benfield Junior. I just wondered if any one went to school with my nan – Diane Roxbee? Or my Dad – Paul Newnham? Did Peter Crouch really go to Benfield? Maybe he will come to the reunion. Hannah, sorry to disappoint you but, the Peter Crouch in the photo is not the same Peter Crouch who is a Premier League footballer, if that’s what you were thinking. Hannah, I was in the same year as a Newton Roxbee who also went to the grammar school….is he a relative? Yes – Newton Roxbee is Hannah’s uncle. I was interested to see Honor went to Hove County Grammar School for Girls. I went there from 1958 to 1963 and would love to be in touch with any other pupils from there. I visited the school last year and this year when I visited the UK again, and saw it is Hove Park School but the badge is still the same shape. My best friend there was Diana Wilkinson and we lost touch many years ago when I left the UK. Hi. Front row of pic. right side of Paula could be Rosemary Gibbs, left side of Paula could be Angela Mountain. Last one on front could be Micheal Winstanley. 2nd row next to Dereck definitely Willie Mason. 3rd row 2nd from Judith Clark - that’s me Frances Dawes. Hope this jogs some more memories. I have just heard of the passing of Roger Hudson, my first boyfriend many years ago. Our mother’s worked on the land for Farmer Broomfield in Mile Oak, near the Girl’s School location when we were just toddlers. Sympathy to Roger’s wife and children, family in UK. May he rest now in peace, knowing the peace giver. Hi Chris Brown. My brother Richard Burgess, I see is on your list, yes he was there, we used to live in 4 Links Close, Portslade and then moved to 23 Fairfield Gardens Portslade. We left england in 1955 for Australia. I live in Seaford, Australia and my brother Richard is in Adelaide. Was there a teacher called Miss Cuthbert? I’ve found that Pauline Gold’s book (see comment dated 28.10.08) was published earlier this year. It’s called “From Greyscale to Technicolor”. I did actually write Pauline’s last name correctly in my note of 19/09/2010 — it’s “Golds” — but I got edited! I lived at 7 Lincoln Road. Josephine Florey still lives at 91 Eastbrook Road, she never married. I was a student at Benfield School and then went to Mile Oak School for Girls. Those ware the days. Does anyone remember the Rothbury Picture House? How about the Abbot twin brothers, Peter and Phillip? I was born in Brighton, May 1945. I came to America when I was 19 in 1964. I have been having a good read of the entries and there are one or two I can add to: I was with the first intake to Benfield and I can recall that we were allocated little garden plots to cultivate along side the entry drive. Before leaving St Andrews, dear Miss Beli smashed a board pointer on my backside when caning me. Mr Elsworthy managed boxing lessons in class when not administering the ruler treatment. My brothers Peter and Philip still remain well at 65 as does my elder sister Lynne and younger sister Frances. Me well + 70. Chris Mcbrian; I seem to remember Stephen Giles and Christopher Watts. They may have been friends of my brother Richard Burgess. We live in Australia; left England in 1955. Does any one remember us? We lived in Links Close then in Fairfield Gardens Portslade. Happy Christmas and New Year everyone. Jan, wahey! as they say. I remember your brother Richard very well but from Fairfield Gardens period. I used to live at 21. Benfield Crescent. Steve Giles lived at number 11 or 9. I remember the family going to Oz, I was disappointed as Richard was a nice guy. How about Barry ‘Tosha’ Rist, David Dunstall, they lived close by as did Clive Purnell who died in 2008. Get Richard to e-mail me…. mcbrien410-AT-aol-DOT-com. I’m sprayed all over the Net. Happy 2011 to all of the family. Hi Jan Purcell. I am in Brisbane these days. What part of Australia do you now call home? I remember Richard Burgess – his name is strong in my memory banks. I am on email viz: stepheng_1@bigpond.com Would love to hear from you and Richard. Steve Giles (ex Benfield P.S. Portslade). Hi Stephan Giles, I think I remember you from Benfield. I now hear from Chris McBrien who was in Richard’s class. I seem to recall David Dunstall. My email is janprcll8@gmail.com. Richard lives in Adelaide now. Don’t know his address, I am trying to find out. I remember a Chris Watts - does he remember me Janet Burgess and Richard Burgess? We lived at Fairfield Gardens, Portslade. I am now in Seaford, Victoria, Australia and Rich is somewhere in Adelaide. Hi Stephan Giles. I tried your email address to give you Richard’s address but it didn’t work. Please contact me on janprcll8@gmail.com and I will try and send it to you. Bev,any relation to my old classmate Keith Doo? Yes Keith is my brother. he is living in Marlborough. We lived in Millcross road. I have just had a wonderful hour reading the history of comments about Benfield, most of which appear to be outside my era. So I will start with my sojourn at this memorable school. I was in the first intake and was marched to our new school from Southern Cross. I lived in St Andrews Road so my route to school each morning was through the cattle arch mentioned by I think Paul Abbott, a face I cannot remember but should. My teachers included Miss Belinphante, (all my records show the error of my memory as Belephant probably because of her frightening bellow) Ginger of the ‘ruler behind the knees fame’ and Miss Clifford. Miss Hunt the headmistress produced well earned nightmares, I was banned from the dining hall for refusing to eat steamed greens, I was suspended for a week for selling acorn pipes filled with dry-day collections of fag-ends at a penny a go. This was an earner for the lure of the old fashioned sweet shop in Boundary Road. I was also a member of the ballroom dancing team if that jogs any memories. I had two regular partners one was Ennis Wooler, the other I am ashamed to say was a ? I left in 1951 and went on to the Building and Engineering School in Hanover Terrace. Am I remembered? David Foster Smith – I was in the same class as your sister Gillian Foster Smith (Miss Clifford’s class). Sorry to hear about her death. I left about 1968 or 69 to go to Hove Grammar for boys. I still have school photos from then and would be glad to send if anyone can give me an email address to forward them. I think I was one year ahead of you Honor, as the name Honor Patching sounds familiar from HCGS… you might remember me as I used to play the piano on Fridays at Assembly there. Back row: Pete Lansdale, Pam Thompson, Fred Crouch, Valentine Gale, Margaret Hughes, Frances Dawes? Ray Guy, me, Alan Phillips, next Cynthia Herrring, Judith Clarke Margaret Hannaford ?? Susan Vassey, Dave Fuller, Linda Martin, Roger Reeve, Linda Palmer, Barry Rawlinson, Mike Mitchell, Maurice Forrest, Trevor Mayhew, Arthur Pumphrey, Brian Harding, Paul Silve, Kenneth Rist, Paula Harrison, Angela Mountain, Anne Scott, Les Davidson. I have just come across this site and was very interested in the letters on Benfield School. I was one of the first intakes into that school which my father helped to build. I have just come across this site. I went to Benfield between 1958 and 1961. I was in the same class as Lee Pritchard, David Foster-Smith, David Spencer, Steven Burgess, Gloria Harland, Susan Waters. I remember Miss Clifford as my form teacher. She used to have a token system for good work using cut-outs from a newspaper and Friday afternoons we would be moved according to how we’d done in the previous week. I owe so much of my English grammar learning to Mrs. Belafonte but she scared me to death …. she had a very thick stick but I don’t remember her hitting anyone. She once came round to our house, she was canvassing on behalf of the Liberals. I was once very ill with encephalitis. I was off school for months and put into an isolation hospital. The only thing they let me keep was a bundle of letters from my classmates. They were very precious to me. Does anyone else remember? Hi Sally. Just read your comments. I was in that class too, if you remember me. Miss Clifford was great and all I remember was Miss Belinfante scared me to death but I knew my times table off by heart! Do you remember David Orchard and Phillip Geddes? I remember on some afternoons putting 4 desks together and covering them with hardboard sheets and listening to a science(?) programme on the radio – or am I going senile?! Fond memories of a lovely school. I now live in Middleton-on-Sea near Littlehampton but my sister Vickly lives in Portslade – Old Village opposite what was Le Carbone, in one of the old flint cottages and my dad lives on the Old Shoreham Road opposite Victoria Park. He is 84 and is so close to Benfield! Any one else out there? I went to Benfield Junior School from ages 7 – 11 (1970- 1974) the head was Mr Beard at the time and the best teachers were a Mr Stuart and a Mr Clerk, who also taught music. During my first year there was had something called ‘club’ on friday afternoons where we could chose to do things like cooking (usually making mint creams) or even skating, but only if you were a teachers favourite – so I never got to do that. I did however try heraldry taken by Mrs Bellifantie and I still love the subject to this day. So hi to anyone who remember Sara Baldwin as was and hope your all well and happy. Mind you, not pleased to see my beloved Portslade lumped in with Brighton and Hove … we were only swallowed by Hove and it was never a very happy marriage, can’t we have a Portslade site? When I submitted the above photo it was with a view to filling in the missing names and, with luck, sharing some reminices with old school friends. Somehow, however, all sorts of other conversations, most from totally different decades, seem to be going on here. For the record all of the people in the above photo were at Benfield from 1957 to 1960. I found this site quite by accident and was interested to see what comments were made about my old junior school. I instantly recognised the young blonde girl in the back row 2nd left, she is my cousin Pam. I know she enjoyed her time at Benfield but I had to go to the school as our grandmother lived close by and I went to her for lunch. I had Mr Gallagher as a form teacher twice. Looking back his attitude towards girls was appalling he thought educating them was a waste of time as he was fond of telling us. When I left Benfield I was determined to prove him wrong, going on to become a policewomen and later attending university to become a registered nurse. But I often wondered how many young girls’ dreams & ambitions he might have crushed with his derogatory comments. So far nobody has mentioned Mrs. Reidle who taught Music. Sitting in the isle adjacent to me was Carol Lintott. We had to put our name on the top of a piece of work we’d done. In those days our handwriting was scrutinized, ‘t’ was a different height to an ‘l’ and so on. This one day Carol crossed the last two ‘tees’ in her name with one stoke instead of two individual lines, on seeing this, Mrs. Reidle just about had a ‘coronary’ and whacked Carol so hard that she fell out of her chair. Not forgotten that in 60 years. Does anyone remember a girl who attended the school in the late 50s called Carol Glenister? Her family lived in Portslade at 32 St Aubyn’s Road in the 50s and 60s. I was at Benfield from approx. 1960-65. I remember Mr Priesly, Ms Bellafonte, Mr Whiting, Mrs Dawson and another teacher who suffered from asthma like me. Ms Bellafonte scared me to death, she would come into the room waving a wooden rod, a chair leg I believe. I never remember her hitting anyone, but she did pull ears. We all knew our times tables. I remember a fellow student Peter Robinson getting the cane in front of the class, I cried and Mr Priesly had to take me out of the room. Peter had been caught, with another boy, spitting in the toilets. Ms Dawson had a magic voice, she would read to the class for 1 hour every week, we sat mesmerised by her and every week there were loud groans at the end of the hour. Dudley Chander was another boy in my class, he had a wonderful talent for drawing. We were provided with a small bottle of milk at recess which was great in winter when the tops froze but not so nice in the summer when the milk would be warm. I would spend money in the sweet shop on the corner and I would love to buy the small brown acid drops. I remember a boy named David Greenfield who was in another class. I lived in Valley Road opposite Drove Cres, Colin Benson lived opposite. We would make wooden go carts to ride down the green on Drove Cres and in the winter would use a metal tray to slide on the snow. What fun we had. Lovely memories. I have just spotted myself in the picture above – 3rd row up, and 3rd child in from the left in a spotted dress. Remember some of the faces, no doubt we have all changed over the years! Regards to you all, where have all those years gone? I was at Benfield until 1959. I was in Miss Clifford’s class – I thought she was a very good teacher – she got me through my 11+ (a challenge to say the least!). Other teachers I had included Mr Brooks. We had a trainee teacher for a while called Miss Bashford. Other teachers included Mr Priestley who sent me down to the sweet shop one lunchtime to buy him 10 Woodbines. I remember my days at Benfield with great affection. It’s one of those parts of my life I reflect on with warmth and gratitude. When we left we were given a New Testament and I collected my school mates’ autographs in it. My sister Judy has it at the moment. She followed me to Benfield 4 years later. I went on to Hove County Grammar School For Boys where I found the atmosphere distinctly colder………. I came accross this site by accident but none the less recognise some of the teachers names. Gallagher (not a particularly nice fellow) who was my teacher for a while. Mr Clark who wore beige suites in the summer months and looked vaguely like Gregory Peck in his role as Atticus Finch in To Kill A Mocking Bird. Miss Bellafonte a real character who smoked like a chimney but captured my interest during Heraldry club. But sadly what remains with me is the maniachal outbursts when my brother Gary and I stood in his office first thing in the morning whilst he screamed and banged a cricket bat down on his desk because we were late for school. Never mind that our father drove us four or five miles from Mileoak to get there and when I mentioned it he was so angry he was actually frothing at the mouth – terrifying. However on the up side who remembers the music teacher Mr Ellinger who thought he was either Bob Dylan or Cat Stevens with his platforms and flowery shirts. I attended from around 1968 to 1970 when we moved to Worthing. Hi to all and anyone who knew me. I forgot to name the cricket bat banging, manic screaming Mr Beard the then headmaster at Benfield County Primary in my contribution yesterday, so sorry!